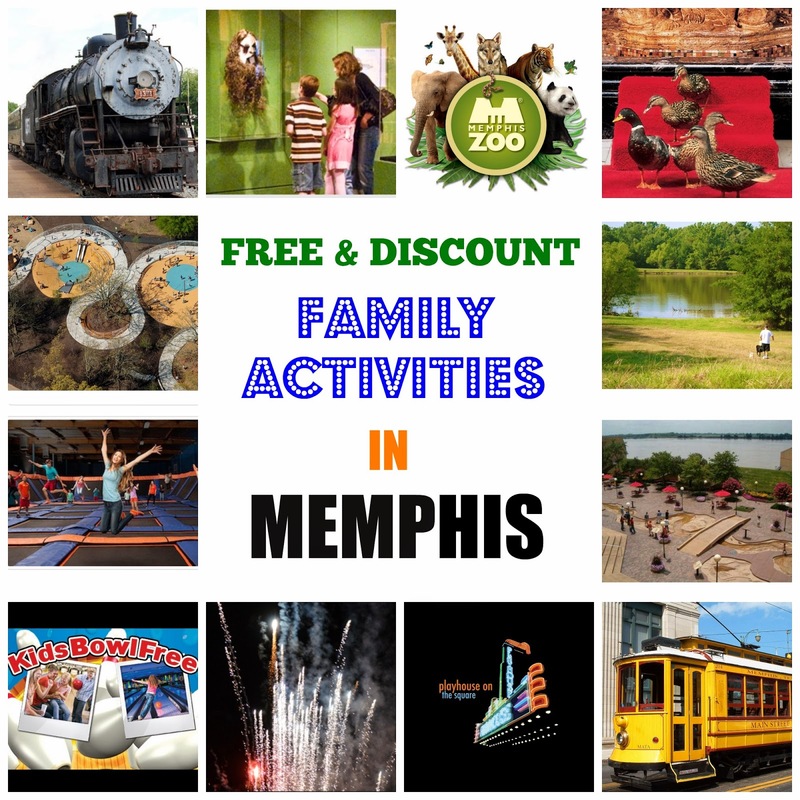 FREE & Discount Family Activities In & Around Memphis! Looking for things to do in the Memphis Area on a budget? Check out this list of Free & Discount activities to do with the family around town. Know of an activity not listed? Leave it in the comments below or email me at mymemphismommy@gmail.com. •Main Street Collierville: Visit quaint shops, restaurants and the train depot. -Five Dollar Fridays: Children of ALL AGES receive ALL DAY admission for $5. •Autozone Park: Lawn/Bluff Seating $5/person. (Free Fireworks on select nights). •Lichterman Nature Center: Free admission to Lichterman Nature Center on Tuesdays from 1:00 until closing. •Memphis Railroad and Trolley Museum: Adults $3.00, under 12 $1.00, 3 and under free. •Memphis Zoo: Free admission on Tuesday from 2 p.m. to close. for Tennessee residents only. NOTE: There is a $3 Conservation Fee to enter the CHINA exhibit where the Giant Pandas are located. Free Tuesdays will not be held during the month of March. •Peabody Ducks: Every day at 11 a.m., the Peabody's famed ambassadors are led by the Duckmaster down the elevator to the Italian travertine marble fountain in the Peabody Grand Lobby. A red carpet is unrolled and the ducks march through crowds of admiring spectators to the tune of John Philip Sousa's King Cotton March. The ceremony is reversed at 5 p.m., when the ducks retire for the evening to their palace on the roof of the hotel. -Woodland Discovery Playground: Tons of play space for all families. -The Outback: The Outback provides more than 100 acres of area designated for off-leash activities for you and your four-legged pal. Happy Hour Hop- Join us for a 60 minute jump beginning between 3pm - 4pm for the price of 30 minutes on Tuesdays - Fridays. This is great for an after school activity or to FLY for a special price! •Greenline: Pedestrian Biking Trail connecting midtown to Shelby Farms. •Pink Palace Family of Museums FREE 3-Month Summer Membership! •Bartlett Movies in the Park! This is a free family-oriented event. Bring your blankets, lawn chairs and enjoy a kid-friendly movie inside W. J. Freeman Park. •Cineplanet 16 in Atoka Movie Series: Free movies. •The Orpheum Theatre-Memphis Summer Movie Series List! •Local Public Library: Most of the Public Libraries offer Storytime & Summer Reading Programs. -Click Here for the Memphis Public Libraries Storytime calendar. -Click Here for the DeSoto, Lafayette, Panola, Tate, and Tunica Counties Storytime Calendar. -Click Here for the Collierville Library for Storytime & Summer Reading Program. -Click Here for Tipton County Storytime & Summer Reading Program. -Click Here for Fayette County Storytime & Summer Reading Program. •Mud Island Riverwalk: The Mud Island Riverwalk is a scale model of the lower Mississippi River. The bumps and contours are a little rough under bare feet, but the kids don't seem to mind. Best of all, the Riverwalk is part of Mud Island's free exhibits. If you can find a free place to park and walk across the pedestrian bridge, this can be a completely free visit. Banana Republic - 35% off Entire Purchase 1/28 Only! Today only, save 35% off your purchase, online only, at Banana Republic with code: BRGETNOW. Ends 1/28. Restrictions Apply. I love this Ruched Jersey Dress on sale for only $64.99 (Reg. $110.00) with code: BRGETNOW. Restrictions: 35% off your purchase: Offer valid 1/28/2015 from 12:01 AM EST through 11:59 PM EST at Banana Republic online only in the US (including Puerto Rico). Not valid in Canada, at Banana Republic stores or Banana Republic Factory Stores. Discount does not apply to GiftCards, packaging, shipping and handling, applicable taxes, Banana Republic Factory Store merchandise, or BR Picks, BR Monogram Collection, 100% Cashmere, leather apparel, men's suit jackets, men's blazers, designer collections & collaborations, and third party branded merchandise (i.e. Superga). No adjustments on previous purchases. Not valid for cash or cash equivalent. Online promotional codes cannot be used on reserve in-store purchases. Cannot be combined with other offers or discounts including the Gap Inc. employee discount. Check out this fun Theo Klein Service Car Station for $69.99 (Retail $120)! Fila Women's Comfy Jacket & Pants Deals $17.99-$19.99! These look so comfy. Hurry over to check out these deals on Fila Women's Comfy Jackets and Pants! Choose from FILA Jackets for $19.99 or Pants for $17.99! Not only are these tops and pants ideal for gloomy weather; they also evoke a sense of athleticism no matter what you're doing. This is just too cute. Right now, you can get this Godinger, Ferris Wheel Cupcake Holder, White for only $14.99 (Retail $69.99). There is also a Carousel Cupcake Holder for only $16.99 (Retail $69.99). Kohl's is offering Buy Select Furniture Item and Get A Second for ONLY $1 and Buy One Get One For 1/2 Off - items are marked. Plus take and additional 20% off with code NEWYOU20 and orders over $75 score free shipping. I just grabbed two Linon Allure Counter Stools for $76.79 (Retail $94.99) with Free Shipping! That's $38.40 per chair! Have you been using phone books or other items to raise you computer monitor? Today only, get this nice Silver/Black 3M Adjustable Monitor Stand for only $17.99 (Retail $44.99). •Contemporary design with stacking columns raises monitor from 1-Inch to 5 7/8-Inch in increments of 1 5/8-Inch to an ergonomically correct level. •Features 11-Inch of storage space underneath to maximize desk space. •Great for laptops, printers or monitors up to 80 lbs. 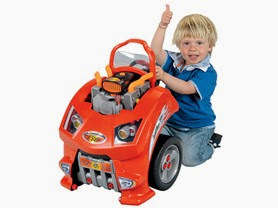 •Non-skid legs keeps stand in place. Top of base is bare plastic. My daughter will love this. Right now you can get this Disney Frozen Memory Match Game for $6.99. Baby Bjorn Mesh Baby Carrier $35.99 Shipped! Need a baby carrier for your little one? Amazon currently has this highly rated BABYBJORN Baby Carrier Original in Black for only $35.99 + free shipping (regularly $99.95!). * Easy to use. Fits parents perfectly and securely with only a few adjustments. * Carry facing forward once he or she is a bit older and able to hold up his or head own head. You will need to click on the color to find prices. I think this is super cute! Right now get this Suppion Retro Vintage Rhinestone Crystal Big OWL Pendant Necklace for only $4.89 Shipped!